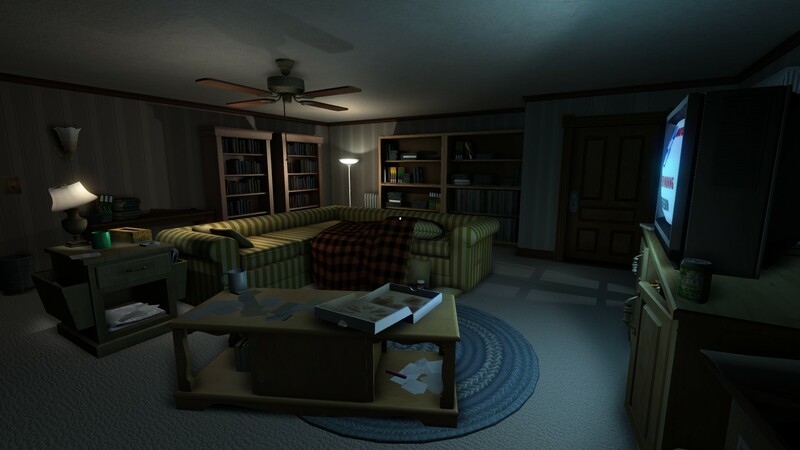 So, as of late March 2013, we’d been working on Gone Home for a full year. 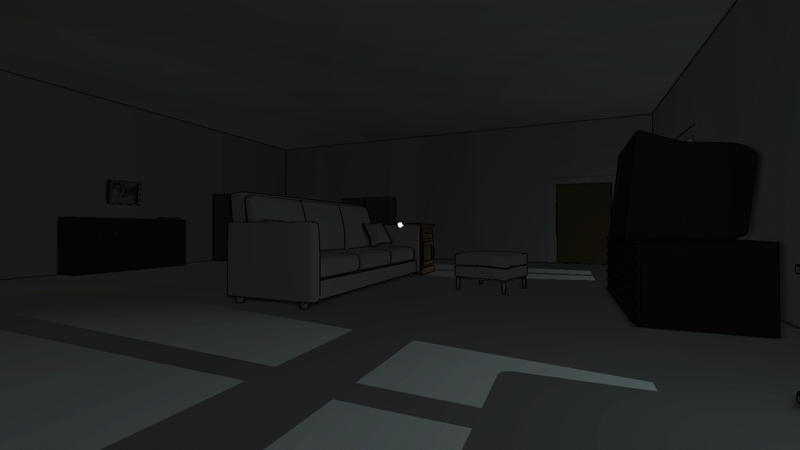 Just today, Karla found a couple of screenshots from April 30, 2012– basically the very first rough draft of the house in its most basic form. It’s nearly April 30, 2013 now. Let’s see what a year of development looks like! The 2012 shots are from immediately after we started talking to Kate about working with us; she’d just sent her art test in and that little side table with the magazine holders on the sides was one of the very first meshes she sent in! It’s the one asset that’s consistent between the shots… we’re keeping it! When you ship assets that an artist submitted as their art test, you know they’re good. It wasn’t long after this that Kate joined the team full-time. 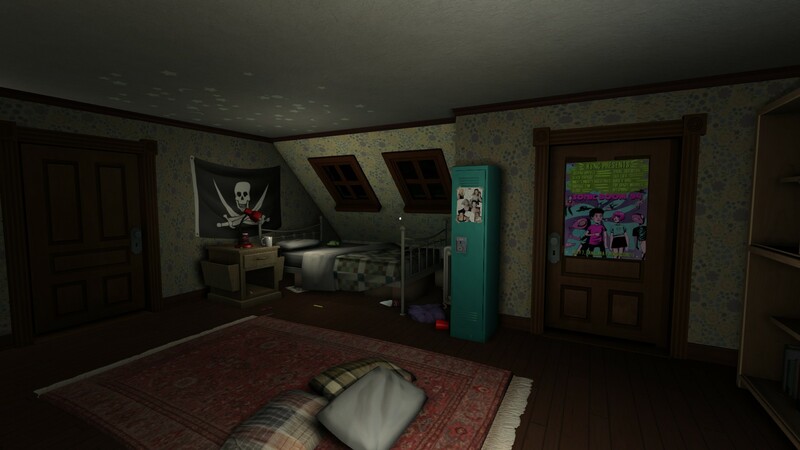 Aside from that, it’s kind of surprising how stable the layouts of the rooms and the placement of relevant objects has stayed. 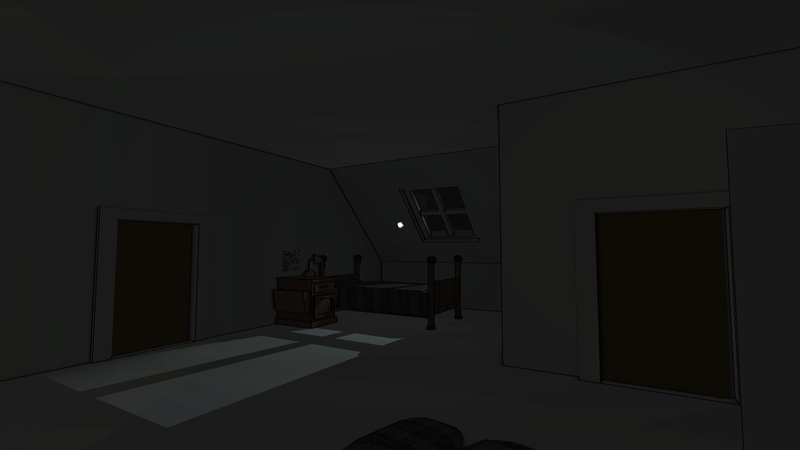 The shapes of the rooms, placement of the doors and important furniture, windows and so on is basically the same. You can even see the edge of the pillows on the floor of Sam’s room in the 2012 shot! But it does kind of highlight part of our process, which is that we came up with a plan early on, and have stuck to it and just tried to produce that idea instead of making big sweeping changes. Which, as a small, self-funded team, is important for actually getting a project done in a timely fashion. I’m glad that the Greenbriar house looks both so recognizable and so very different one year on. This entry was posted in Art, Media. Bookmark the permalink. Wow, that’s an incredible jump. The new environments feel so much more real and lived in, but still carry a definite sense of loneliness. This looks sooooo good. Love the moody new shots and it’s great to see the development. Can’t wait for this game! Dang, that’s some major progress in a year. Those assets look great. Is Sam’s bedroom final? It looks a tiny bit empty, I think. It’s like you guys made this game for me!! I can NOT wait to get my hands on this game!! !